Over the past year, Sprout Social has planted many seeds—and yet another has blossomed. 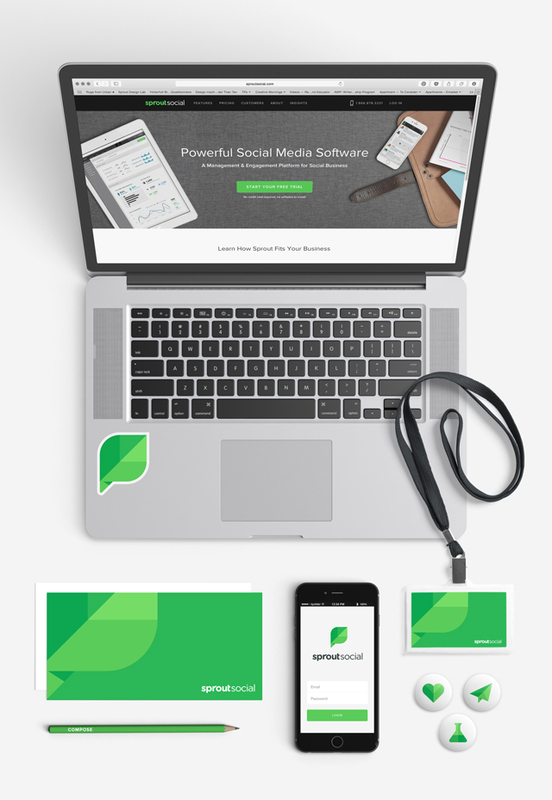 To reflect a company that is on the move, Team Sprout decided that the timing was right to give our branding an update. From the colors you see every day in our platform to the logo that encapsulates our core product features, we have, in effect, turned over a new leaf. We’re grateful for all the feedback and praise our customers have shown after unveiling the new leaf, and we wanted to share some insight on what went into this effort as well as what it means for the team and our customers. When the founding team started working on Sprout back in 2009, we were focused first and foremost on delivering an absolutely stellar, user-friendly product to a budding market. During our scrappy beginnings, most of our design expertise was directed at the customer experience and more strategic operations, but a day would eventually come where we could redirect some of this energy back into the brand. In 2015, our growing workforce of 180 team members now includes an in-house design team dedicated to crafting an extraordinary user experience, developing a clean and consistent app interface, and shaping our visual identity. This spring, the Visual Design team set its sights on giving our brand the attention it deserved. After months of researching, brainstorming and iterating, we landed on a mark that pays homage to the original Sprout leaf but is primed to lead us into the future with new layers of dimension and a sure sense of self. After exploring several concepts that outright avoided any hint of a leaf at all, our process led us back to our roots. Good branding, after all, stands the test of time, and consistency is key in remaining recognizable. When Sprout Social was named, it was because we wanted to help businesses grow in their social engagement. That mission holds true today, but as we’ve grown into ourselves, we now possess a more nuanced understanding of what it is we bring to our customers. It was time for a logo that conveyed the breadth of our offerings—and did so in a contemporary way. Engagement: Starting with the most obvious attribute, the new leaf takes the shape of a conversation bubble to highlight the engagement aspects of our platform—helping people and businesses connect to solve everyday business challenges. We believe all parties are best served when they can have open conversations and speak freely. Publishing: Gaze at the leaf longer, and you will notice that it also looks a bit like a paper airplane. With this symbol becoming more ubiquitous for sharing content, we decided to incorporate it to showcase Sprout’s powerful publishing capabilities—helping businesses schedule social messages to reach audiences at the most optimal time. Analytics: Finally, the leaf’s veins create a series of facets that loosely reference our data visualization capabilities. The reporting portion of Sprout’s platform helps brands glean a stronger understanding of the impact of their social efforts. We hope this provides some more context for the change and where we stand as a brand. The team is undoubtedly more sophisticated today than when we first started, but as we grow, we remain scrappy in spirit, and the leaf lives on to remind us of this. Gilbert Lara: Gil Lara is the Creative Director and Co-Founder of Sprout Social. When he’s not creating with the Design team at Sprout, you can find him trashing his kitchen, experimenting with Mexican cuisine. Follow him on Twitter @gilbertlara.